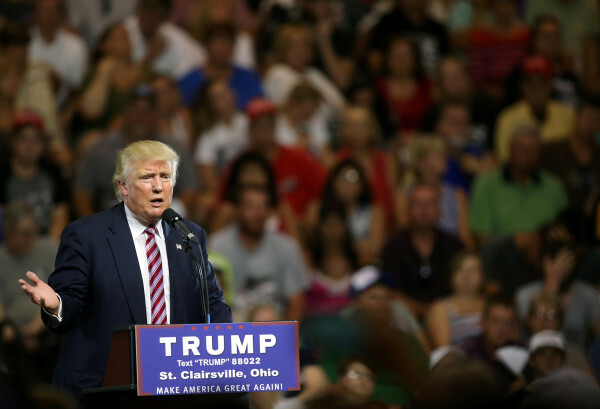 Republican U.S. presidential candidate Donald Trump speaks at a campaign rally in St. Clairsville, Ohio, Tuesday. WASHINGTON — Presidential candidate Donald Trump and the U.S. Chamber of Commerce on Wednesday continued to diverge sharply on trade policy, the latest example of divisions within the Republican Party that threaten unity ahead of the Nov. 8 election. He said new trade deals should be negotiated because foreign countries are taking advantage of America. “Every country that we do business with [looks] at us as the stupid people with the penny bank,” Trump said Wednesday at the rally. The Washington-based lobbying group, which represents the nation’s largest corporations and business interests, is typically a reliable backer of Republican policies. But it took issue on Tuesday with Trump’s vocal opposition to international trade deals, calling his proposals “dangerous” ideas that would push the United States into another recession. Trump said the Chamber’s argument that his policies would cause a trade war were incorrect because the United States was already at a deficit. In speeches on Tuesday, Trump called for renegotiating or scrapping the North American Free Trade Agreement with Canada and Mexico, calling it a job killer, and reiterated opposition to the pending Trans-Pacific Partnership among the United States and 11 other Pacific Rim countries. He also lambasted China’s trade and currency policies. The Chamber has consistently backed international trade deals. So far, the Chamber’s political action committee has donated $134,000 to federal candidates or their committees, with $127,500 of that total going to Republicans, according to U.S. government campaign finance records. Billionaire Republican donor Paul Singer, who bankrolled an effort to try to defeat Trump during the campaign’s nominating phase, said on Wednesday that a Trump presidency and his trade positions would almost certainly lead to a global depression. “The most impactful of the economic policies that I recall him coming out for are these anti-trade policies,” Singer said during a panel discussion at the Aspen Ideas Festival in Colorado, according to CNBC. But opposing trade deals has proven a winning strategy for Trump among voters concerned about the loss of manufacturing jobs. Art Laffer, an economic adviser to President Ronald Reagan who supports Trump, said he did not like the tone of Trump’s speech on Tuesday but thought it was an improvement over his past comments on trade. Peter Navarro, a Trump trade policy adviser, defended the candidate’s position. Trump also took fire from for his positions on trade from Democrats. In a call organized by rival Hillary Clinton’s presidential campaign, U.S. Sen. Mark Warner of Virginia, a former businessman and tech entrepreneur, said that while the country needed to do a better job protecting workers, more resources should be put into training them for a new economy. He also pointed out that it was unusual to see a Republican standard-bearer and the Chamber divided. Clinton held no public campaign events on Wednesday but did announce she would appear next week with President Barack Obama, the first time this year that he and his former Secretary of State have campaigned together.